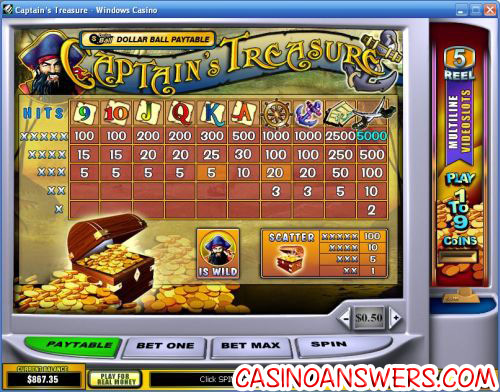 Captain’s Treasure Video Slot Guide & Review - Casino Answers! Captain’s Treasure is a 5-reel, 9-line video slot from Playtech with wild symbols, scatter wins and a progressive jackpot. 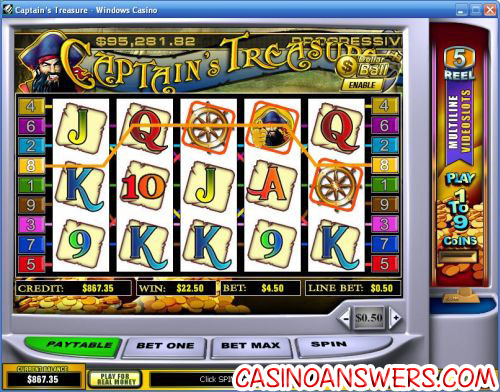 You can play Captain’s Treasure at Windows Casino and Europa Casino. To play the Captain’s Treasure slot machine, you must first set your line bet. Available wagers are $0.01, $0.05, $0.10, $0.25, $0.50, $1, $2 and $5. Select your number of paylines by hitting “Bet One” or hit “Bet Max” to play Captain’s Treasure with all 9 lines active. We strong recommend playing all 9 lines on Captain’s Treasure. You can bet as little as a penny per spin, and as much as the $45 maximum bet. To spin the reels on the Captain’s Treasure video slot, use the “Spin” button. Captain’s Treasure offers several different possibilities for big wins. The Captain’s Treasure top fixed jackpot is the double sword symbol. Five double sword symbols on an active payline will win you the 5000 coin top jackpot. The treasure map is another substantial jackpot – five of these symbols are worth 2500 coins. The wheel and anchor are worth 1000 coins each. Enable the Dollar Ball mode and you can play for Captain’s Treasure’s progressive jackpot. The Dollar Ball lottery costs $1. You get 5 numbers out of 49 to choose from. If all five numbers match, you will win the Captain’s Treasure Dollar Ball progressive jackpot lottery. At the time of this writing, the progressive jackpot is over $95,000. The Dollar Ball feature cannot be activated in practice play. The Captain’s Treasure video slot’s wild symbol is the Blackbeard-inspired pirate captain himself. He will complete any winning combination except for scatter wins. The pirate captain symbol does not pay out by itself. The scatter symbol in Captain’s Treasure is the gold chest. All you need is two of these anywhere on the reels for it to payout. It doesn’t even need to be on an active payline. Scatter wins are multiplied by your total bet, rather than by your line bet (as payline wins are). Captain Treasure has an autoplay mode, found under “Menu.” You can play up to 9999 autoplay spins. Use the arrows on the left of the box to use its advanced features. Advanced autoplay feature are to stop on a jackpot win, if a single win is more than (any value you enter), if the overall win on autoplay spins total more than (any value you enter) and if the overall loss on autoplay spins total more than (any value you enter). You can also modify the delay between spins. You can cancel autoplay at any time if you feel you may be in over your head. We appreciate the ability to be able to enter your own values as well as being able to modify the delay between each spin. Captain’s Treasure may be a little dated now, but it’s still a decent 9-line video slot. If you’re looking for a newer pirate slot with more in the way of special features, we recommend Captain’s Treasure Pro. You can play either edition of Captain’s Treasure at Windows Casino. Are players from the United States able to play Captain’s Treasure for real money? US players are unable to deposit and play at Playtech casinos. If you’re still looking for a pirate-themed slot machine, please read our CTXM Pirate Slots Review. Is there an instant play version of Captain’s Treasure? Yes, Windows Casino has both download and Flash versions of their online casino. If you don’t have Flash installed on your computer or you have any problems playing the Captain’s Treasure Flash game, you can download the newest version of Adobe Flash Player. Does the Captain’s Treasure video slot feature a progressive jackpot? Yes, real money players can play for the Captain’s Treasure Dollar Ball progressive jackpot. Enable the Dollar Ball feature and you can pick 5 of 49 numbers for $1 per game. If your numbers match, you will win the Captain’s Treasure progressive jackpot. If 4 match, you will win 1% of the jackpot. At nearly $100,000, even winning 1% of the Captain’s Treasure progressive jackpot is a sizeable win.